As an artist in residence with the Bavarian Radio Symphony Orchestra, the American cellist Yo-Yo Ma had the opportunity to do what is perhaps the second thing he loves the most after playing: sharing his love of music with others. During his residency, he transformed himself from sensitive teacher to inimitable Bach interpreter to first cello of a major symphony orchestra. Yo-Yo Ma doesn't fade away into the music, nor does he take a worshipful attitude towards the pieces he performs. From the moment he walks onto the stage, he exudes charisma that immediately confirms his exceptional status as the 'best cellist in the world'. With its ten variations on a theme of knightly character for full orchestra, Richard Strauss tone poem 'Don Quixote' not only depicts the colorful adventures of Cervantes' chivalrous hero, but also functions as a virtuoso display of glorious solo melodies embedded in stunning orchestral passages. It is, in a way, a second Strauss cello concerto. Joining 'the Don' later is a viola solo that personifies the faithful Sancho Panza and is played by Wen Xiao Zheng. 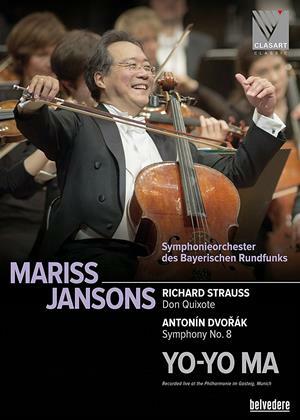 To those in the know, Jansons partnership with the great Munich-based BRSO is one of the most transcendent conductor-orchestra pairings.